You have two options for getting patterns. 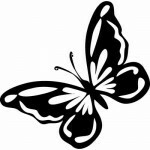 You can make them from wallpaper designs (see the second video) or print free ones from the Fashion Frog Stencils. As in every craft project that includes painting, you must not get in a hurry. There are a few guidelines that you should follow when stenciling creative designs on your kitchen cabinet doors. Follow these stenciling steps for decorating your cabinet doors with various paint colors and patterns. Wash the cupboard doors with Dawn dish soap and water. Precisely locate where the pattern should be on the doors. Using the painters tape, adhere the stencil into the correct position. Dip your brush in the paint and use your dabbing plate to remove any excess. Start applying the color with barley any paint on the brush by dabbing it on lightly. If there’s too much on the paint it will seep under the stencil and ruin the design. You want to build the color with several thin layers. Once you finish with one color wash the stencil off and allow it to dry before placing it on another door. While you are painting the patterns you can experiment with different brush strokes to get different textures in your design. Don’t worry about the mild paint marks that may appear outside of the patterns lines. Once your stencil painting is completed on the kitchen cabinet door, no one will notice that you were slightly outside of the lines. This overage will give your painting extra character. 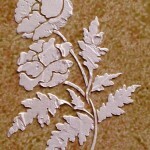 Want to know how to make a stencil for painting on cabinet doors? In the video below Megan Carter demonstrates how to cut out a pattern and what materials you will need to make it out of. 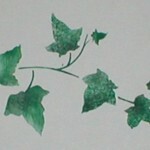 To make stencils you will first need to find a pattern that you would like to trace. If you are a good fee hand artist, then you won’t need a pattern. It’s best to locate a picture that has disconnected parts because this will make it easier to cut out. Place the plastic over the area you want to trace and follow the lines with your fine point permanent marker. After your pattern is transferred onto the plastic, color in various parts to determine what your stencil painting on the cabinet doors will look like. Cut out the pattern on a board using the razor knife. Depending upon the size of the cabinet door area you may need to make several stencils. If you are using different colors close together, it’s a good idea to make individual stencils for each color. This will safeguard against painting the wrong color in the wrong space on the doors. When stencil painting your kitchen cupboard doors, remember to take your time. Never get in a hurry. The old saying: “haste makes waste” rings truth throughout generations of mistakes. Your cabinet doors are not something to goof up on. Painting Cabinet Doors Lacquer-How many coats are needed? Is there a special type paint that needs to be used for wood doors? We have kitchen cabinets that are close to five years old. They have a natural maple look.